Most crop farmers have limited options to reduce the damaging physical effects of drought. Although Federal disaster program and crop insurance payments tend to be higher during droughts, they typically do not fully compensate farmers for drought-related losses. Farmers with access to ample sources of irrigation water can, at least partially, mitigate drought stress: irrigation both provides water and cools the crop. However, many water-intensive crops, including corn, are mostly grown on non-irrigated cropland. Drought-tolerant (DT) corn was commercially introduced in 2011. 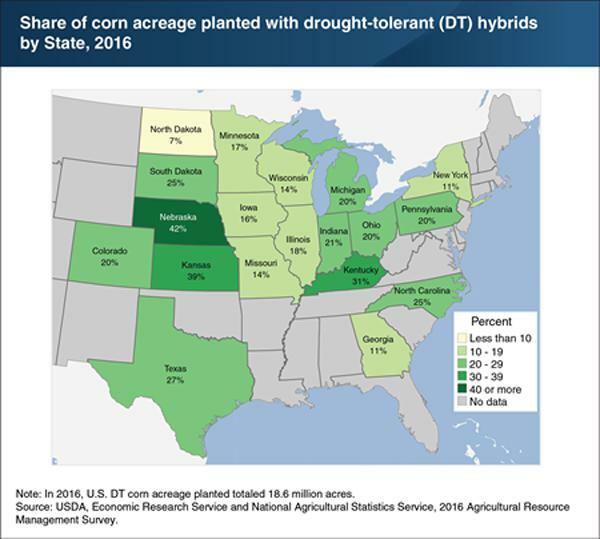 By 2016, DT corn acreage made up 22 percent of total U.S. planted corn acreage, with the highest shares in drought-prone Nebraska (42 percent) and Kansas (39 percent). Regional differences in drought severity and how recently farmers had experienced drought significantly influenced the adoption of DT corn. For example, States with counties that had experienced at least one severe-or-worse drought between 2011 and 2015 had adoption rates of at least 25 percent. Northern corn-producing States—such as Minnesota, Wisconsin, and Michigan—experienced less severe droughts during this time period and had lower adoption rates, ranging from 14 to 20 percent. This chart appears in the December 2018 ERS report, Development, Adoption, and Management of Drought-Tolerant Corn in the United States.